Here’s a fun little live streaming show that was shot on New Year’s Eve and hosted by Mike McCafferty and Dawn Cody. Jason Makiaris makes an appearance in it too. If you’re a gamer, you’ll probably especially like this because these guys spoof those countdown shows by doing a countdown of the top ten Halo games of all time. I should warn you that there is some profanity in this video, but it is very minor. Mike and Jason on Acceptable TV Tonight? This is a quick reminder that Acceptable TV is on tonight on VH1 at 10:00 p.m. Eastern/Pacific time. It repeats again at 11:30 p.m. and re-runs play throughout the week, so check your local listings. 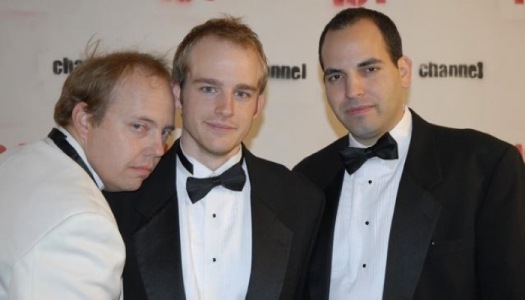 Will Mike McCafferty and Jason Makiaris beat the competition with their show L33t Haxxors 2? Watch and find out! Mike and Jason Need Our Help! As a follow up to Friday’s post, I want to remind everyone that your vote is very much needed to help Mike McCafferty and Jason Makiaris’ show L33t Haxxors Episode 2 get on VH1’s Acceptable TV this Friday. If they don’t get enough votes, their show doesn’t air…simple as that. And that would be a shame! Time is short as Jason informs me that the voting ends Wednesday afternoon. So please take a minute and go the Acceptable TV website and vote. Jason has written some great instructions, complete with pictures, on how to register and vote, which I’m copying and pasting below for you. Hopefully some of you caught our big VH1 debut last Friday night. Thanks for all of your help and well wishes! A number of you have mentioned that you voted (which is great) and a number need some more info. Step 1. Log on to the Acceptable.TV site. We’ve made it easy for you. Just click on the link here. Step 3. Fill out the fields with your information with a vaild e-mail address so that you’ll receive your registration confirmation. Step 4. Make sure that you have checked the box signifying that you accept the user-agreement and the box verifying that you are over the age of 18. Then click “submit my info”. Step 5. Go to your e-mail account, where you should find an e-mail that looks like the following. Click on the link to confirm your account. Step 6. 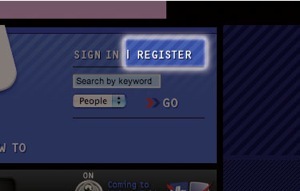 Once you are brought back to the AcceptableTV page by the link, make sure that you are logged in. 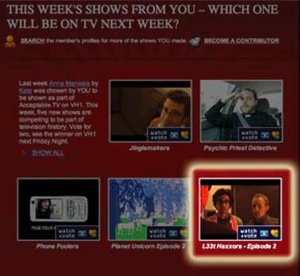 From AcceptableTV’s home page, scroll down to the user submitted show section in red. Find our show on the list, and click on it. Step 7. At the top of our video’s page, you will see a list of eligible videos to choose from. Click on the heart with “vote for this video” next to it. We appreciate the support and, hopefully, you’ll see us on your picture boxes this Friday night!